LEBANON, Tenn. (July 23, 2014) – Cracker Barrel Old Country Store® and The Secret Sisters announce the release of Put Your Needle Down: Deluxe Edition, which will be available on August 4 exclusively at all 630 Cracker Barrel Old Country Store® locations and online at crackerbarrel.com. The digital album will also be available for purchase at select digital retailers. Put Your Needle Down: Deluxe Edition contains two brand-new and exclusive bonus tracks not found on the regular edition that was released in April. Produced by T Bone Burnett, the album contains 14 songs and will sell for $11.99. Find the most current The Secret Sisters tour dates from our partners at Country Music On Tour, your trusted country concert ticket source! Country Music News Blog participates in advertising programs that help fund the operation of this site. For more information please visit our privacy statement. 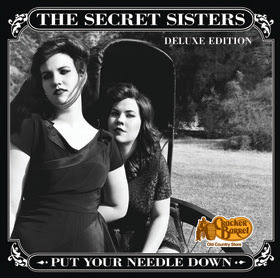 This entry was posted in News, The Secret Sisters by Country Music News. Bookmark the permalink.